"This is just crazy", said the waitress at the Hilton Garden Inn in Pikeville, KY when I explained the basics of the Cloudsplitter 100, in response to her inquiring about my race outfit. It was early on Saturday morning and I was the first person to show up for breakfast. She kept going but her thick southern twang sounded to me like a foreign language. My Austrian accent was likely incomprehensible to her as well, so I didn't tell her that I had just spent the week in London before flying back to Dayton and driving for five hours on Friday evening to reach this remote part of the country. But I was sure it would have solidified her opinion. 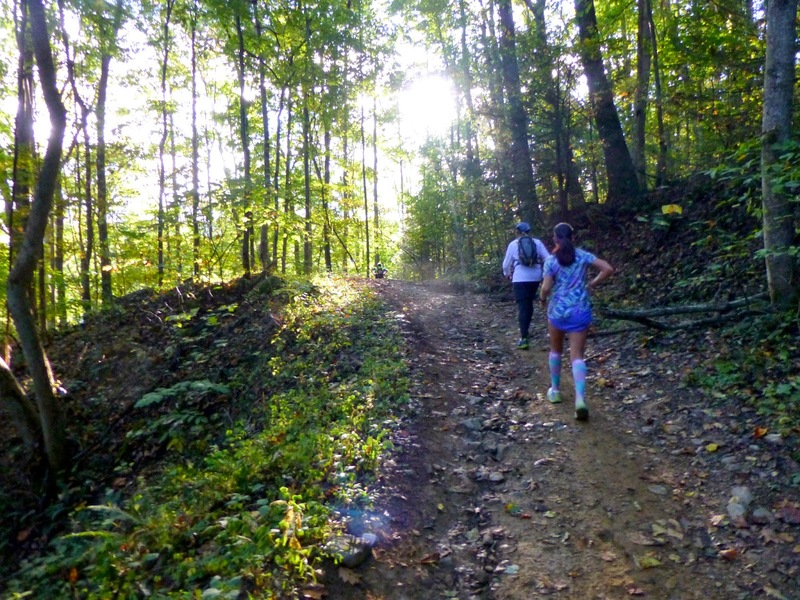 The Cloudsplitter 100 was the first ultra marathon mountain race ever held in the state of Kentucky. 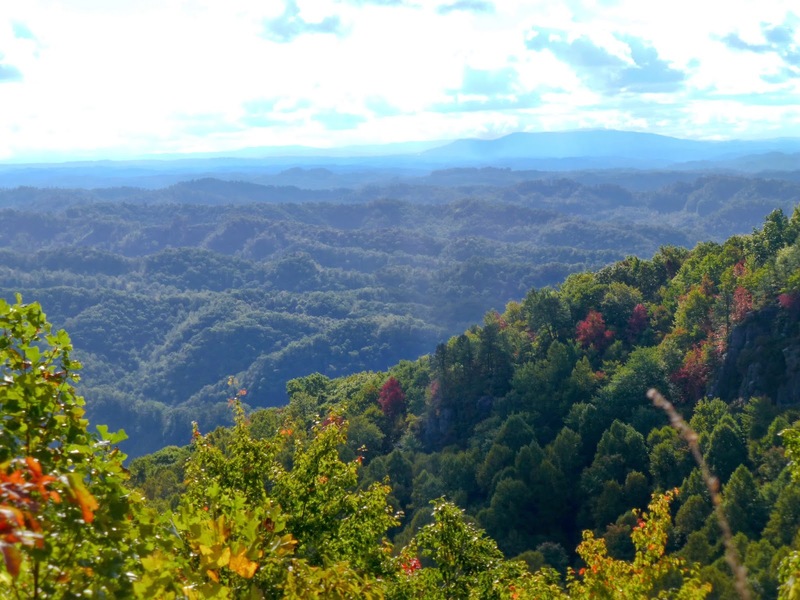 It was located on Pine Mountain in the heart of Appalachia. Several distances were offered including 100 miles and 100 kilometers. I had signed up for the shorter of these two options, thinking it would be crazy to attempt 100 miles. Obviously that distinction made little difference to the waitress. She clearly thought I was crazy anyway. 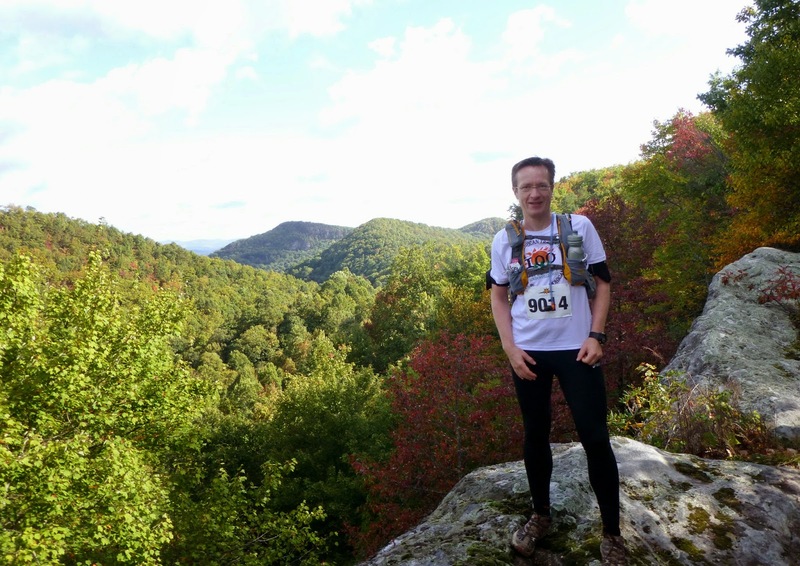 And since this was my first-ever 100 kilometer race, considered to be one of the hardest trail races in the Eastern United States, I did not feel inclined to protest. 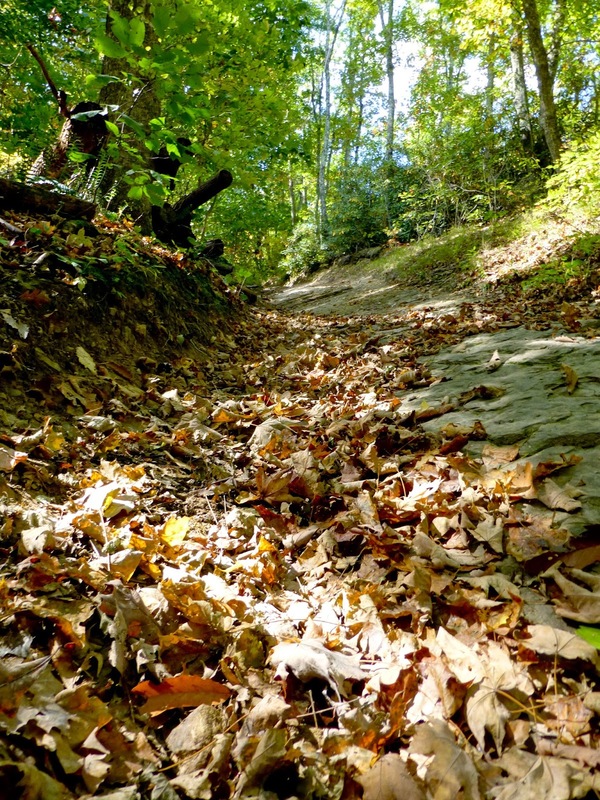 The Pine Mountain Scenic Trail started at the bottom of the valley in Elkhorn City (population 964), ascended steeply to the top of the ridge, and then traced a geological fault line along the southern Kentucky-Virginia border. Virtually no section of the trail was flat. It either went up or down, and more often then not, the grades were very steep. This explains why, over a distance of 100 kilometers, the trail climbed 17,000 feet - more than the total elevation of Mont Blanc from sea level. Although my legs were fresh, I decided to take it easy and positioned myself towards the back of the pack. Everyone around me was walking the initial climb from Elkhorn to the first aid station 12 km into the race. Although it was quite cool (6 degrees C), climbing generated a lot of body heat, and I stopped to remove my long sleeves. As we approached the ridge, the woods opened up to reveal breathtaking views of Virginia. This was a welcome excuse for a short break to take some pictures. The leaves just started to take on color. The air was crisp and clear. Only a day or two ago it had still been very warm, but now Fall had definitely arrived. 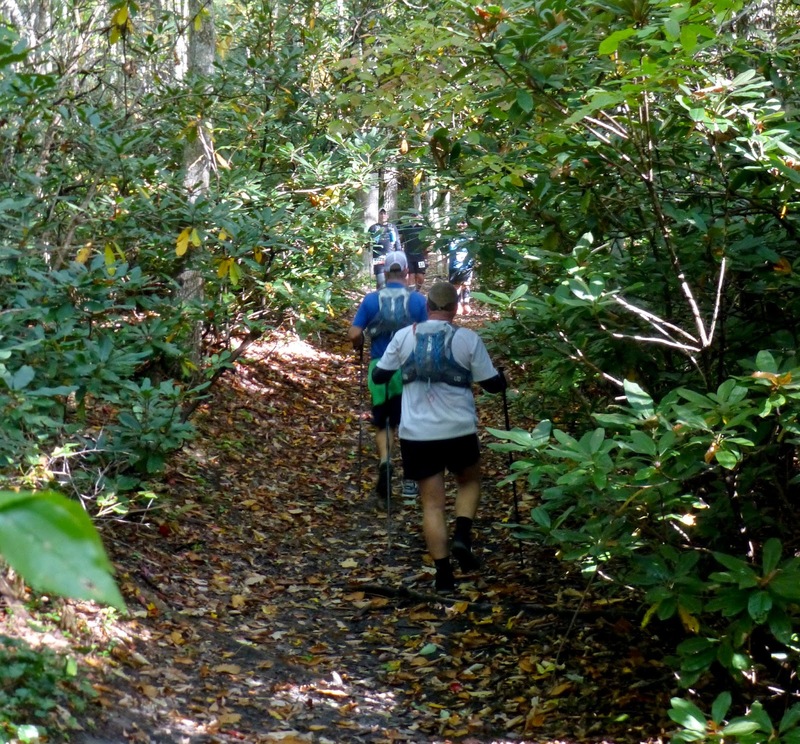 A few runners got lost in the midst of giant rhododendron bushes, and vigorously argued which trail was correct. According to the US Forest Service, Rosebay rhododendron is native to Southern Appalachia and can grow 40 feet tall with trunks up to 12 inches in diameter. It forms dense thickets that exclude almost all sunlight from the forest floor, with its maze of twisted, tangled stems. Local mountaineers have labeled these all but impenetrable snarls of vegetation "hells" or "slicks." It was definitely confusing and left me wondering about the challenges I would face on the return trip, when it would be completely dark. The second aid station was in such a remote part of the forest that it could only be reached by pack horse. I reminded myself to be extra careful with my footing. I did not like the idea of having to be rescued on horseback in case of an injury. 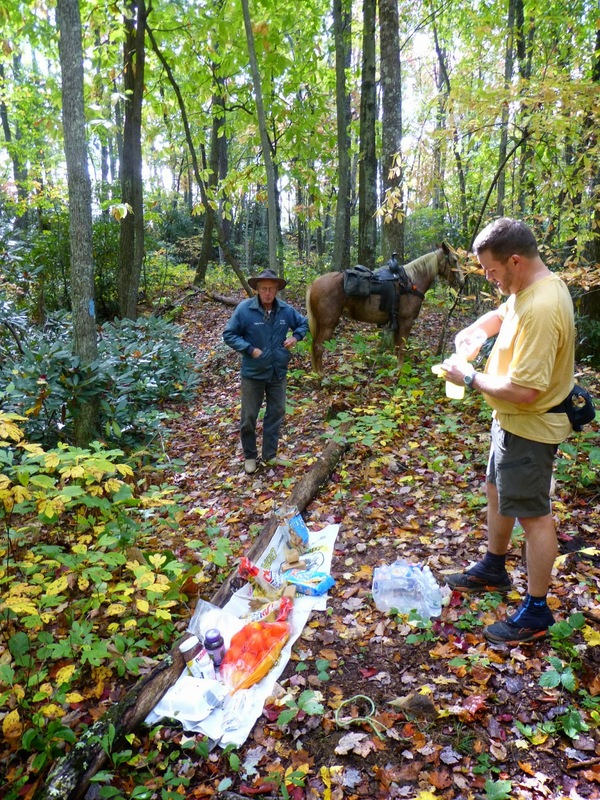 The aid station volunteer explained that the local horse club was responsible for maintaining the trail. They obviously had done a great job and I asked him to pass on my thanks to his fellow club members. The next section offered exceptional scenery as the trail traced narrow ledges formed by granite blocks. The views were exceptional in all directions, even if there was the occasional sign of human intervention in the otherwise pristine wilderness. 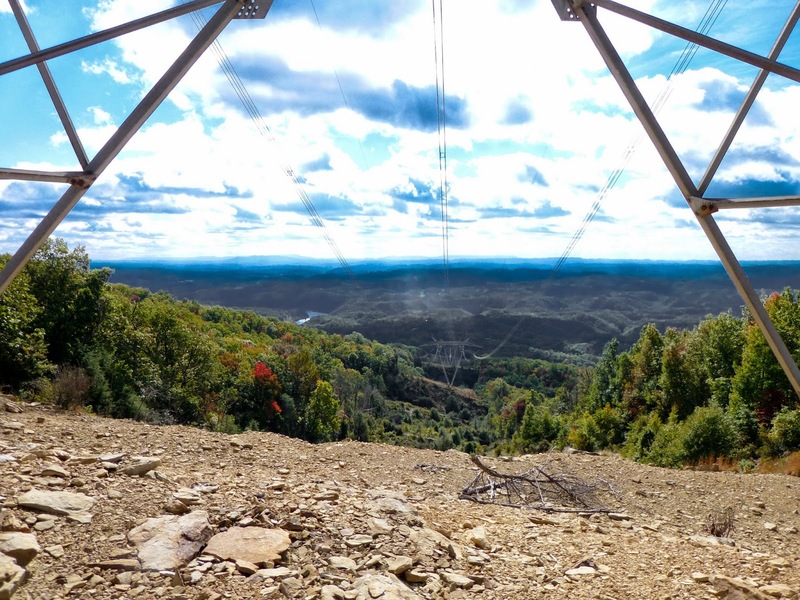 It seemed one could feel the electricity when crossing underneath this power line at the top of the ridge. This was especially palpable later on the dark return leg. It was impossible to truly capture how steep many of the sections were. GPS indicated grades of up to 40%. Descending such inclines often took me longer than climbing them. 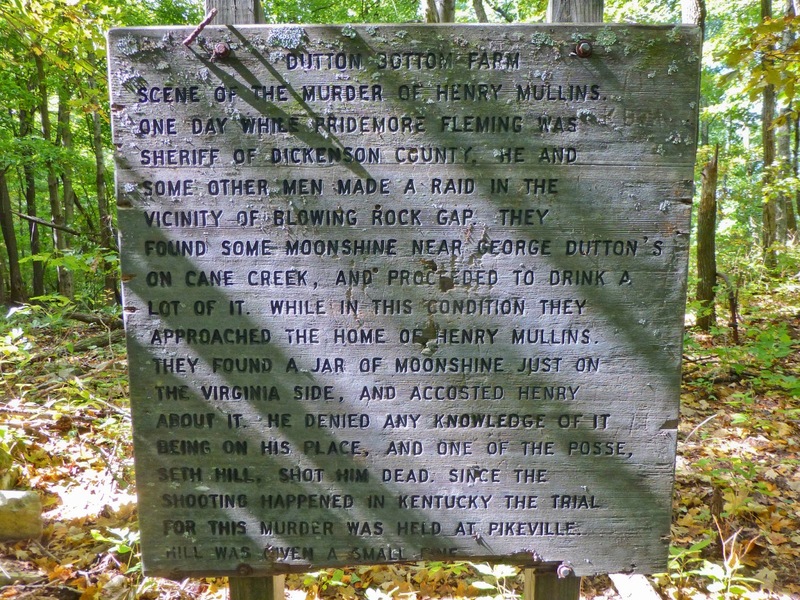 Signs telling stories of pioneers ... and murder. About an hour and a half before sunset I reached the half-way point of the race. The last few miles had been long and tedious and I was glad to reach the aid station. After eating three cups of potato soup, changing my socks and shoes, and donning my lights, I felt rejuvenated and ready to take on the second leg of the race that would lead me right into the night. A ranger told me about the frequent bear encounters and insisted that I be careful. Several racers had already spotted bears out on the course. I continued with some trepidation as it gradually got darker and darker. However, once the light was completely gone, I got used to moving through the night. The trail was quite technical and demanded a lot of attention in order to avoid tripping over rocks and roots. That, in addition to focusing on navigation, made me soon forget about the bears. Just after it had turned completely dark, I caught up to another racer. Tackling the night together felt a bit easier as we continued onwards. Unfortunately, he soon developed severe stomach issues and had to stop at the next aid station, where two medical students promised to take care of him. We were in a very remote location. It had taken the students more than two hours to reach the trail per ATV on a very rough and steep track. Driving an ATV at night was impossible, so they offered to keep the racer in one of the tents they had set up for themselves. It was just past 9 PM, and with the nearest racer 30 minutes ahead of me, I had no choice but to continue on my own. Running was now pretty much out of the question, and with about 35 kilometers left to go, it promised to be a long and lonely walk. I kept in good spirits and trudged along. I considered listening to music or an audio book but decided against it, so I could stay better aware of any animal activity. The temperature was dropping precipitously and the forecast was for frost above 3,000 feet, which was where I headed. The wind picked up as well and the projected chill factor was for negative 5 degrees C.
Suddenly, I heard a loud crack right next to me, my heart rate jumped, and I stopped in my tracks. I turned and spotted the culprit: a deer, caught in my headlight. Just as the saying goes, the deer stood there, frozen, my light shining directly at it, merely a few feet away. It was so close, I could have poked it with a walking stick. At least the adrenaline increased my circulation and I instantly felt a bit warmer. From then on I must have been on auto-pilot as I don't have many recollections of the following trail sections except that I happily changed into warmer clothing when I picked up my drop bag at the Birch Knob aid station around 11 PM. 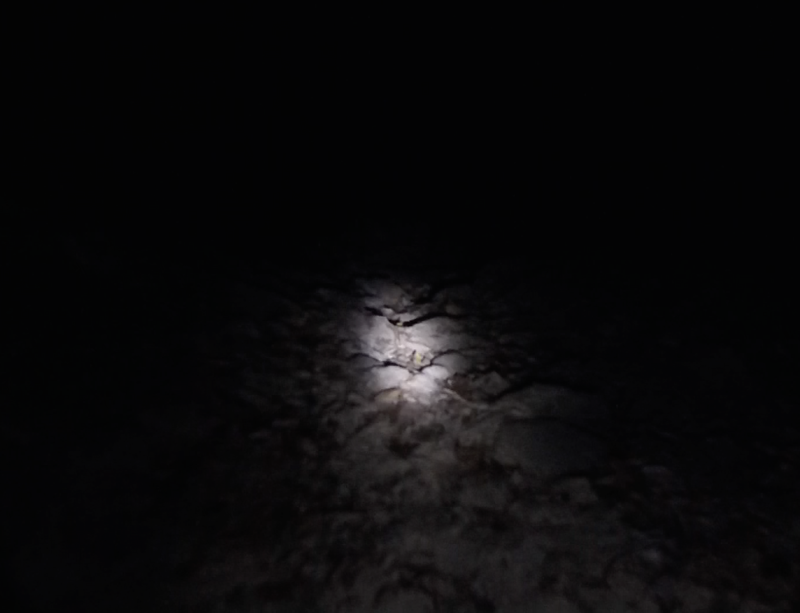 Several hours later, at around 2:25 in the morning, I reached the second-to-last aid station, where I was offered to be joined by another runner whose friend had dropped out due to cramps and overwhelming fatigue. I felt sorry for his friend who decided to quit with just 12 kilometers left to go. Huddled in a hooded sweater next to an open fire pit, he tried to stay warm as he waited for an ATV to pick him up. He looked miserable and did not say a word. Nevertheless, I was pleased about the unexpected company as my new-found companion and I headed out together. He was an experienced ultra-runner, and I happily followed in his footsteps, no longer worrying about navigation. We descended a very steep trail into a valley and were making good progress. Spurred on by the company of an accomplished athlete, I picked up the pace and was moving much faster than I had on my own. Until, suddenly, we came upon a huge tree laying straight across the trail. Neither of us remembered climbing over a tree like this in the morning. Right next to the tree was a pink plastic ribbon like those that were used to mark our course wherever the typical yellow or green blazes were missing. It was puzzling. Had the tree fallen during the race? On closer inspection the color of the ribbon looked somewhat faded. It became apparent that something was not right. Before the race I had loaded the gpx track of the route onto my iPhone. Now I was glad that I had skipped the music, which meant that there was still plenty of power left. The phone delivered proof: we were at least 2 kilometers off track. The good news was that the phone also showed where we needed to go. The bad news was that we had lost at least two hundred meters of altitude, which we had to climb back up to reach the correct trail. The detour cost us more than an hour. My companion - who was also an experienced race director - kept complaining about the trail markings, clearly unhappy that this was now becoming his slowest ultra race performance ever. I was in no mood to argue. Instead, I reminded myself that the search for adventure was one of the key reasons why I did this race in the first place. This detour and the subsequent route finding definitely qualified as adventurous. This thought, and the fact that it was my iPhone that helped us out, allowed me to never lose my good spirits. After a while I stopped to connect my watch to a back-up charger and suggested to my companion to surge ahead. I enjoyed doing the remaining kilometers alone, not having to listen to more complaints about the race organization, which I thought had done a remarkably good job putting up this inaugural race in such a remote region and in challenging terrain. I reached the finish line at 6:30 AM, 22 hours and 28 minutes after setting out the previous morning - proud that I finished my first 100 kilometer run on a very demanding and challenging mountain trail and never considered quitting. I admit there where moments during which I pondered whether the waitress may have been right. But then I decided that I didn't care. 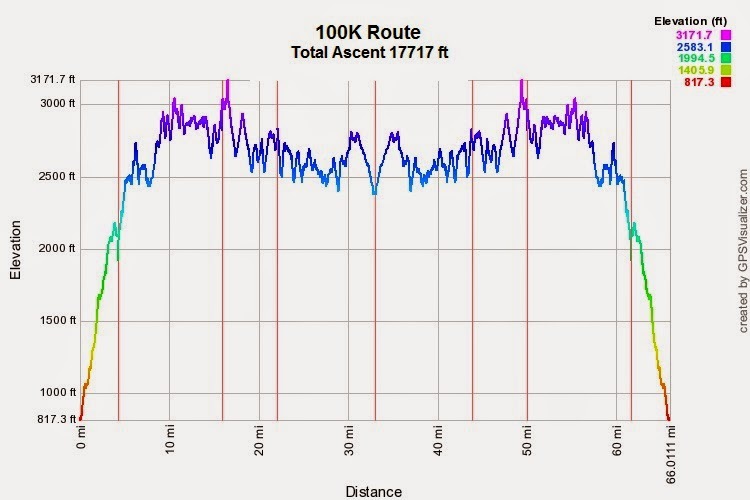 I'm running the 100k this weekend. My first 100k. I got a lot out of your post. Thank you! Thank you! I wish you the best of luck! It's a hard and long course, so start off slowly, don't think of it as a race, instead approach it for the adventure that it definitely is. Staying positive mentally is key. Finishing is what counts. Also, dropping out on this course is very difficult and you may suffer more than if you keep going. So commit to yourself to see it through and don't worry how long it takes. All best wishes!